I don't even know what's going on here. This toy website tells me that Japan Ken wears 'Japanese-styled clothing and a samurai-inspired sword.' Japan Ken, if you are Japanese, why is your clothing Japanese "styled" and your sword samuri "inspired"? 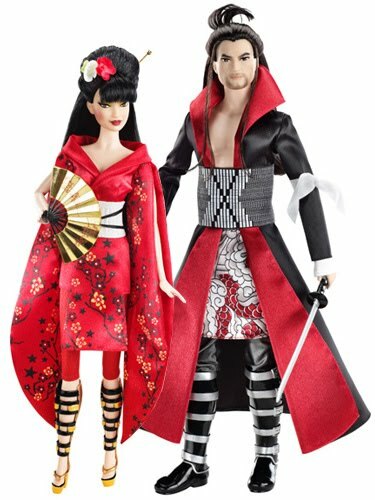 A (former doll collecting) commenter in this Racialicious post comments that apparently Mattel intentionally went with a futuristic look, which I can dig - but then why are they Japan Ken and Barbie? There is definitely a whole lot of fetishisation and exotification in here, and not that I want to be all 'hey Asian skin doesn't look like that' because of course there are light-skinned Japanese people, but I feel like it is not going out on a limb to say that those Barbies, if they were sans their Japanese-style future clothes, would look awfully Caucasian. You know. Just like all the others to come before (except for Geisha Barbie and Chinese New Year Barbie, of course, who were no less exotified but at least...kinda looked Asian? ).